Background: Habb (Pill) is one of the important dosage forms of Unani system of medicine. A number of effective formulations are manufactured in form of Habb because of its various advantages. Out of these, Habbe Irqun Nisa (HI) is a popular anti-inflammatory formulation used in the treatment of Warame Mafasil (arthritis) and Irqun Nisa (sciatica). Nowadays, with increased incidence of these diseases many non-steroidal anti-inflammatory drugs (NSAIDs) are being used in their treatment. Owing to the adverse effects of these drugs, the use of herbal medicines is seen as a better alternative.The basic requirement for the development of Unani system of Medicine is the standardization of single and compound drugs. HI is mentioned in National Formulary of Unani Medicne and selected for the present study. Materials and Methods: HI was prepared manually with the powder of crude drugs, passed through sieve no. 100 and mixed with 1% w/w of gum acacia in mucilage form. It was then dried at 60°C for 90 min and then tested for its standardization on different physicochemical parameters, e.g. organoleptic properties, pH values, moisture content, ash values, friability, hardness, weight variation, disintegration time, and thin layer chromatography (TLC). Results and Conclusion: The data evolved from this study will make it a validated product and will help in the quality control of other finished products in future research. Habb (pill) is an ancient dosage form of Unani system of medicine invented by Hakeem Seelon. 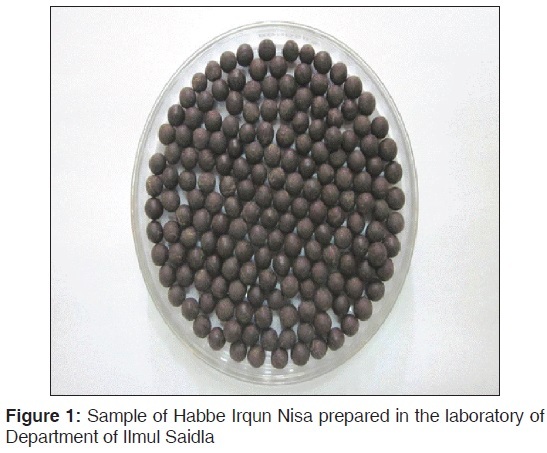 Numbers of Unani formulations are prepared in the form of Habb and, out of these numerous Huboob (plural of Habb), Habbe Irqun Nisa (HI) is a very common and popular formulation that is mentioned in Qarabadeene Azam and National Formulary of Unani Medicine (NFUM)., It consists of three crude drugs namely Sibr, Post Halela Zard, and Suranjan Shirin., These plant drugs have various pharmacological activities. Sibr (dried juice of Aloe barbadensis) has analgesic, anti-inflammatory, and hepatotonic activity. Post Halela Zard (dried pericarp of Terminalia chebula) has astringent,,, diuretic,, and laxative, activity and it is also useful in gout and rheumatism., Suranjan Shirin (dried corns of Colchicum autumnale) has analgesic and anti-inflammatory activity,, and it is used in gout and rheumatism as well., Apart from the pharmacological actions of its ingredients, HI as a compound formulation, is used as muqawwie asab (nervine tonic), mulaiyin (laxative), and mohallile waram (anti-inflammatory) and is also indicated in the treatment of irqun nisa (sciatica), niqras (gout), and wajaul mafasil (arthralgia). It is a popular anti-inflammatory formulation of Unani system of medicine, but no quality control studies have been performed on it as yet. The rising popularity of herbal products, both as food and food supplements and as phytotherapeutic drugs, has given rise to many reports describing adverse health effects, variable quality, efficacy and contents of herbal products. Thus, it has become essential to develop reliable, specific, and sensitive quality control methods using a combination of classical and modern methods of analysis. Standardization is essential for ensuring the quality control of the herbal drugs. All the above mentioned factors that possibly act as drawbacks in the acceptance of the Unani formulations have necessitated the urgency for their standardization. This work was undertaken with the objective of evaluation and physicochemical standardization of a classical Unani anti-inflammatory formulation-HI. The method mentioned in NFUM was followed for the preparation of HI. The ingredients, Sibr (Aloe barbadensis), Zard (Terminalia Chebula), Suranjan Shirin (Colchicum autumnale) were taken in equal quantities of 5 g each, as mentioned in NFUM [Table 1]. The ingredients were procured from a crude drug dealer in Bangalore, and all of them were identified by an expert. Total 16 batches (each batch was prepared with 15 g of powder) of HI were prepared with different conditions, i.e., binder, particle size, time of drying, and temperature of drying. All 16 batches of HI were evaluated for hardness, friability, and disintegration time. The batch with minimum friability, hardness nearest to the standard value, and minimum disintegration time as per pharmacopoeias was selected as the final batch. All crude drugs of the selected final batch were ground into a powder with the help of an electric grinder and passed through sieve no. 100 to get powder of particle size of ≤ 150 µm. Loabe Samaghe Arabi (gum acacia mucilage as binder) was prepared as per Pharmacopoeia of India, briefly, 4 ounces of gum acacia in small pieces was taken and added in 6 fluid ounces of water in a beaker, and the mixture was stirred frequently till the gum dissolved. HI was prepared manually repeatedly for performing different tests with 15 g of the powder as sample in the laboratory of Department of Ilmul Saidla, NIUM, Bangalore as per the instructions given in NFUM. After their preparation, they were dried in a hot air oven at the temperature of 60°C for a duration of 90 min. HI was manually prepared in the form of pills (circular in shape). The powders of all ingredients of HI (15 g) were made into lubdi (dough) of proper consistency by adding sufficient quantity of Loabe Samaghe Arabi gum acacia (1% w/w). Loabe Samaghe Arabi was prepared by mixing 0.15 gm of Samaghe Arabi in 2.5 ml of DDW and this prepared Loab was mixed with 15 gm of powder. The lubdi was rolled by fingers into suitable size sticks. The sticks were measured by vernier calliper to maintain uniformity of size, and the thickness of sticks was kept as 6 mm. The sticks were cut manually into equal pieces with the help of a sharp knife to get small pieces of the desired size and weight. All the pieces were measured and weighed for consistency in size and weight. The cut pieces were rounded between the fingers to form Huboob (pills). The pills were placed in a hot air oven and dried. Loss of weight was equal in all pills after drying. 2. 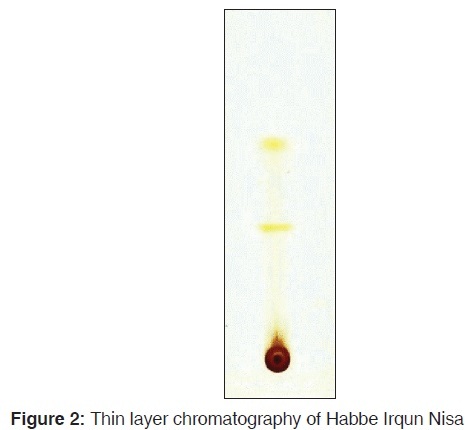 Thin layer chromatography (TLC). TLC was carried out on TLC pre-coated aluminium plates, silica gel 60 F 254 (layer thickness 0.25 mm) for alcoholic extract of HI in n-hexane: acetone (7.6:2.4) as the mobile phase. The alcoholic extract of HI was prepared by the hot extraction method, i.e., soxhlet extraction method. The HI was ground and converted into coarse powder, 10 g of this powder and 200 ml of ethanol was taken in the ratio of 1:20. The whole process was allowed to run until the solution in the siphon tube of the extraction chamber of the soxhlet extractor became colorless. It took about 5 hours to complete the procedure. Proper spotting was only possible by using concentrated liquid, otherwise the spots are very light Therefore the liquid mixture was filtered and allowed to get slightly concentrated by heating on the water bath. The Rf values of the spots were calculated by the following formula. The organoleptic characteristics, i.e., appearance, color, smell, texture, and taste of HI were found to be spherical pill-like, dark brown, pleasant and sweet, hard, and slight bitter and astringent, respectively, as given [Figure 1] and [Table 2]. Average weight was found to be 244.8 ± 2.12 mg [Table 3]. Average diameter was 7.00 ± 0.00 mm [Table 4]. 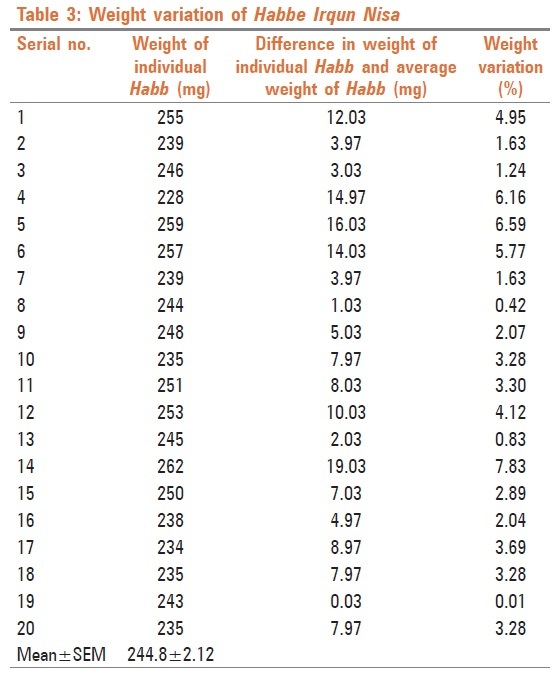 Average hardness of pills was 4.33 ± 0.33 kg/cm [Table 5]. Friability was found to be 0.18 ± 0.04% [Table 6]. pH was found to be 4.78 ± 0.01 in 1% aqueous solution and 4.35 ± 0.01 in 10% aqueous solution [Table 7]. Moisture content was 8.17 ± 0.17% w/w [Table 8]. Loss of weight on drying was 11.50 ± 0.10% w/w [Table 9]. Total ash, acid insoluble ash, and water soluble ash of HI were found to be 4.59 ± 0.31%, 2.06 ± 0.09%, and 2.68 ± 0.06% w/w, respectively, [Table 10]. Alcohol and water soluble content were found to be 5.95 ± 0.15% and 46.00 ± 0.19% w/w, respectively[Table 11]. Non-successive extractive values were found to be 40.51 ± 0.28% and 25.39 ± 0.12% w/w with water and alcohol, respectively [Table 12]. Successive extractive values were found to be 0.07 ± 0.00%, 0.46 ± 0.03%, and 22.67 ± 0.18% w/w with petroleum ether, chloroform and alcohol, respectively [Table 13]. Disintegration time was 32.67 ± 0.88 min [Table 14]. Total alkaloidal estimation was 0.59 ± 0.00% w/w [Table 15]. In TLC two spots were found in HI and their Rf Values were found to be 0.42 and 0.72 [Figure 2] [Table 16]. Organoleptic properties can be used for rapid identification of the drug and these help to determine the quality of drugs. The organoleptic characteristics, i.e. appearance, color, smell, texture, and taste of HI, were found to be spherical pill-like, dark brown, pleasant and sweet, hard, bitter, and astringent, respectively. pH value of the drug is also an important parameter. Drugs that are weak acids are better absorbed from the stomach than from the upper intestine. It was found to be 4.78 ± 0.01 in 1% aqueous solution and 4.35 ± 0.01 in 10% aqueous solution and both were weakly acidic. The moisture content indicates the quality of the drug and also its efficacy. Excessive moisture content becomes an ideal medium for the growth of different types of bacteria as well as fungi, which subsequently reduce the purity of the drug. The percentage of moisture content was found to be 8.17 ± 0.17%. Moisture may vary in same drug due to different climatic conditions and quantity of moisture is different in same climatic condition in different drugs. Presence of 8.17% of moisture is acceptable and it is the standard fixed for future batches, if prepared, in the same climatic condition. Loss of weight on drying at 105°C is done to determine the amount of water, all or a part of the water of crystallization or volatile matter in the sample, which is removed during drying, and it was found to be 11.50 ± 0.10%. The ash value of the drug is an important parameter for the detection of impurities and adulteration. Hence, ash value determination furnishes a basis of determining the identity and purity of the drug and gives information related to its adulteration with inorganic matter. The mean percentage values of the total ash, acid insoluble ash, and water soluble ash of HI were found to be 4.59 ± 0.31%, 2.06 ± 0.09%, and 2.68 ± 0.06%, respectively. These are the ash values of compound formulation made up of several ingredients. References or Data regarding the ash values of compound formulation are not available by which the confirmation of purity or impurity is possible. Hence on the basis of Ash value of compound formulation, it cannot be concluded that this drug is pure or impure, unless or otherwise all the ingredients of compound formulation have been properly checked. In this preparation, first identity and purity of all the ingredients was confirmed by various parameters and after confirmation compound drug was prepared. Ash Value of the compound drug only indicates the presence of this much ash in this particular drug which may be helpful for future batches. Extractive values in the different solvents are based on the quantities of different chemical constituents that are soluble in them. It is an important test to check the quality of the drug and any variation in the chemical constituents leads to a change in the extractive values. The mean percentage of the non-successive extractive values of HI were found to be 40.51 ± 0.28% and 25.39 ± 0.12% with water and alcohol, respectively, and successive extractive values were found to be 0.07 ± 0.00%, 0.46 ± 0.03%, and 22.67 ± 0.18% with petroleum ether, chloroform, and alcohol, respectively. This is the standard fixed of Habbe Irqun Nisa for future references. Water and Alcohol soluble matter. In some cases, the amount of drug soluble in a given solvent is an index of its purity, e.g., acacia must yield not more than 1% of water insoluble residue to meet the official requirement. The mean percentage of alcohol and water soluble content were found to be 5.95 ± 0.15% and 46.00 ± 0.19%, respectively. There is no range of extractive values, these values indicates the amount of soluble constituents in particular drug in the given solvent. If reference of extractive value of a particular drug in a given solvent is available, then it can be say that this value is under, over or within the range by comparing the reference value. Above data shows the extractive values of compound formulation and these values may be taken as standard values for future batches. Estimation of quantity of alkaloids A slight deficiency of alkaloid in a preparation may cause a marked decrease in physiological effect; on the other hand, a slight excess may cause toxic effects when the preparation is administered. It therefore follows that the accurate estimation of the quantity of alkaloids present in a medicinal substance is an important subdivision of pharmaceutical analysis. The mean value of total alkaloidal estimation was found to be 0.59 ± 0.00%. Literature of all the ingredients shows that there is no any toxic alkaloid present in the ingredients. So it can be concluded that this range is acceptable. Weight variation test is done to help ensure that a pill contains the proper amount of drug that helps to maintain the good quality and good efficacy of the pill. Only one pill was found to be out of the limit of ±7.5%. Hence, the percentage weight variation of the laboratory samples was found to be within the prescribed pharamacopoeial limits of ±7.5%. The mean weight value was found to be 244.8 ± 2.12 mg.
Uniformity of diameter of the circular hand-made pills was also measured. The mean value of the diameter was found to be 7.00 ± 0.00 mm. Hardness test is done to determine the force needed to fracture or break the specimen along its diameter. The mean value of the hardness was found to be 4.33 ± 0.33 kg/cm, which is above 4 kg/cm, the minimum acceptable hardness for uncoated tablets. Friability test is done to find out the possible reduction in the weight of solid dosage forms as a result of mechanical erosion during handling. The mean percentage of friability was found to be 0.18 ± 0.04%, which is very good in comparison to the maximum permissible limit of 1%. TLC is one of the important parameter used for detecting adulteration for judging the quality of the drugs. Two spots were found in HI and their Rf values were found to be 0.42 and 0.72, respectively. As confirmatory test for identification and purity of all the ingredients was also done before preparing the compound formulation, therefore, it is clear that this preparation was made by all pure ingredients.Rf values only indicates that, if any one, will prepare this formulation with the same ingredients, the Rf Values should be same. 1. Nabi MG. Makhzane Mufradat wa Murakkabat. New Delhi: CCRUM, Ministry of H and F.W. Govt. of India; 2007. p. 310. 2. Anonymous. National Formulary of Unani Medicine. Part-3. 1 st ed. New Delhi: CCRUM, Ministry of H and F.W. Govt. of India; 2001. p. 15-8, 149. 3. Khan MA. Qarabadeene Aazam. New Delhi: Aijaz Publishing House; 1996. p. 78. 4. Duke JA. Handbook of Medicinal Herbs. 2 nd ed. United States of America: CRC Press; 2002. p. 15. 5. Duke JA. Handbook of Medicinal Herbs. 2 nd ed. India: Replika Press Pvt. Ltd; 2002. p. 17-8, 45, 180-1. 6. Nadkarni KM. Indian Materia Medica. 3 rd ed, vol. 1. Mumbai: Popular Prakashan Private Limited; 2009. p. 1205-10. 7. Khare CP. Indian Medicinal Plant: An Illustrated Dictionary. New York: Springer Science+Business media; 2007. p. 653-4. 8. Chopra RN. Glossary of Indian Medicinal Plants. New Delhi: National Institute of Science Communication and Information Resources, CSIR; 2002. p. 242. 9. Anonymous. The Useful Plants of India. New Delhi: National Institute of Science communication and Information sources; 2006. p. 628. 10. Wallis TE. Textbook of Pharmacognosy. 15 th ed. New Delhi: CBS Publication; 2005. p. 226-7. 11. Mishra A, Kumar V, Mishra AK, Ghosh AK. Formulation and standardization of Panchsakara Churna: An ayurvedic preparation. J Pharm Res 2010;3:2110-1. 12. Sahoo R, Swain PK. Standardization of Kutajaghana vati: An ayurvedic polyherbal formulation. Int J Pharm Sci Res 2011;2:2686-9. 13. Anonymous. Indian Pharmacopoeia. vol. 1. Ghaziabad: Indian Pharmacopoeia Commission; 2007. p. 20. 14. Waring EJ. Pharmacopoeia of India. New Delhi: Asiatic Publishing House; 2010. p. 62. 15. Pandey MK, Singh GN, Sharma RK, Lata S. Standardization of Yakrit Plihantak Churna: An ayurvedic polyherbal formulation. Indian J Pharm Sci Res 2012;3:171-6. 16. Anonymous. Physicochemical Standards of Unani Formulations. Part 4. New Delhi: CCRUM, Department of AYUSH, Ministry of Health and Family Welfare; 2006. p. 142, 144-5. 17. Jenkins GL, Knevel AM, Digangi FE. Quantitative Pharmaceutical Chemistry. 6 th ed. New Delhi: CBS Publishers; 2008. p. 225, 229, 235, 280. 18. Afaq SH, Tajuddin, Siddiqui MM. Standardization of Herbal Drugs. Aligarh: A.M.U. Press Aligarh; 1994. p. 33, 41. 19. Anonymous. British Pharmacopoeia. Blumsberg Square, London: General Medical Council Pharmaceutical Press; 1968. p. 1276-7, 1285-8. 20. Anonymous. Quality control methods for herbal materials. Geneva, Switzerland: WHO Press; 2011. p. 29, 31. 21. Sutharsingh R, Kavimani S, Jayakar B, Uvarani M, Thangathirupathi A. Quantitave phytochemical estimation and antioxidant studies on aerial parts of Naravelia zeylanica dc. Int J Pharma Stud Res 2011;2:52-6. 22. Lachman L, Liberman HA, Kanig JL. The theory and practice of industrial pharmacy. Mumbai, India: Varghese Publishing House; 1991. p. 297-301. 23. Dandagi PM, Halakatti PK, Mastiholimath VM, Patil MB, Manvi FV. Rapidly disintegrating Domperidone tablets. Indian Drugs 2006;43:594-7. 24. William L and Wilkins. Remington The Science and Practice of Pharmacy. 21 st ed, vol. 1. New Delhi: Wolters Kluwer Health (India) Pvt Ltd; 2006. p. 916-8. 25. Vijaya KS, Mishra DN. Rapidly disintegration oral tablets of Meloxicam. Indian Drugs 2006;43:117-21. 26. Rashmibala S, Kumar SP. Standardization of Lasunadi Vati: An ayurvedic polyherbal formulation. Int J Pharm World Res 2011;2:1-9. 27. Goodman and Gilman's. The Pharmacological Basis of Therapeutics. 10 th ed. U.S.A: McGraw-Hill, Medical publishing Division; 2001. p. 5. 28. Jahan N, Afaque SH, Khan NA, Ahmad G, Ansari AA. Physico-chemical studies of the Gum acacia. Nat Prod Rad 2008;7:335-7. 29. Anonymous. The Japanese Pharmacopoeia. 15 th ed. Japan: Ministry of Health, Labour and Welfare; 2006. p. 44, 114. 30. Aulton ME. Aulton's Pharmaceutics The Design and Manufacture of Medicines. 3 rd ed. Philadelphia U.S.A: Elsevier Ltd; 2007. p. 463-5.